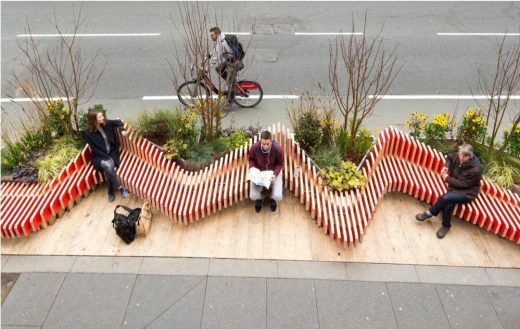 The London Festival of Architecture, in partnership with the City of London Corporation, today announces a design competition for a series of miniature landscaped spaces or ?Parklets?, to be installed across the Square Mile for the Festival in June 2019. The competition will bring additional life and greenery to the City?s streets and public spaces when the world?s largest annual architecture festival returns next summer. Architects, designers and artists are invited to submit a design proposal for a parklet that will transform a kerbside area into a place to rest, relax and admire the City ? a public space fit for a festival. As well as a £6,500 budget for each parklet, the competition offers an outstanding opportunity for exposure to a vast public audience in the City: home to 8,000 residents and a working population of 513,000 people, as well as the 10 million tourists who visit each year.